Just me hanging with one of my tech buddies here at CES 2010 in Las Vegas. The $50 gift certificates were going to be $100, but CNET had a tough year. 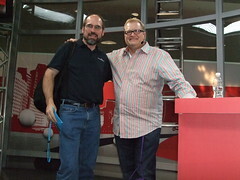 Drew Carey…that is great Joe!!! Drew is pretty funny. Looks like you shed a few – impressive! Hope the show is rocking. Congrats on losing a few. Drew on the other hand looks like he’s been taking advantage of the Vegass buffet chow for a while. And yo Mr. Duck don’t forget Elvis/Cirque news! Viva L** V****s……..